BY DIENER & DIENER WITH PHOTOGRAPHS BY GABRIELE BASILICO. This podcast collection includes essays by 33 authors on the 29 national pavilions as well as the Bookshop in the “Giardini” of Venice, the setting for both the Art Biennale and the Architecture Biennale. These essays, written by architects, historians of art and architecture, artists, and philosophers, discuss the identity of the architecture and its perception in this unique public space. These essays, as contemporary documents, are in the tradition of historical “instructions” on art enjoyment, for example Jacob Burckhardt’s The cicerone: Art guide to painting in Italy, first published in Basel in 1855. Hearing these essays, the listener gets a purely art-historical description of architecture as well as a perspective on these buildings from a different set of eyes. Correspondingly, the writers demonstrate, in an exemplary manner, how, in the eyes of the viewer the architecture becomes an inexhaustibly rich experience. The authors either outline the premises and concepts that underpin the pavilions’ form to develop a loose history of ideas; discuss the ways the pavilions have been outfitted over time; or else talk about their own personal engagement with the architecture. Written in the respective national languages of the pavilions, the essays have been translated for the podcast into English and recorded by actors and presenters. Printed versions of the essays are included on the website and made available to as wide an audience as possible. 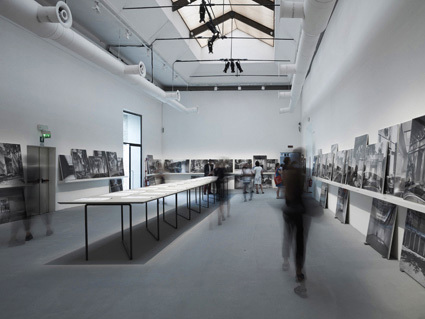 The essays are exhibited in their original language at Common Pavilions, the eponymous exhibition in the Giardini during this year’s biennale. Exhibited along with the essays are photographs of the pavilions by the Italian photographer Gabriele Basilico. The images were curated by Adele Re Rebaudengo. Established in Basel in 1942, the second generation of Diener & Diener has been active since 1980. Originally focusing on residential projects, the firm also systematically develops urban-planning projects as well as projects for the renovation and extension of historic buildings. The source of such designs is founded in an observation of the European city in all its diversity and continuity. Over the past 15 years, Diener & Diener has designed several projects of public nature developed in a consistent cooperation with artists – for instance, the Swiss Embassy in Berlin and Novartis Headquarters in Basel with Helmut Federle. The most recent projects include the reconstruction of the east wing of the Museum of Natural History at Humboldt University, Berlin, and the Mémorial de la Shoah in Drancy, Paris. Since 1980, the Basel office, along with its subsidiary in Berlin, has been run by Roger Diener; since 2011, together with Terese Erngaard, Andreas Rüedi, and Michael Roth. Awards: 2002 – Grande Médaille d’Or d’Architecture, Académie d’Architecture, Paris; 2009 – Prix Meret Oppenheim; 2011 – Heinrich Tessenow Medal; 2011 – DAM Prize for Architecture in Germany. Roger Diener is Professor of Architecture and Design at the Swiss Federal Institute of Technology in Zurich (ETH) and a Member of the Berlin Monument Authority. Gabriele Basilico (1944 – 2013) lived and worked in Milano. In the early 1970s, after graduating from the Faculty of Architecture, he began to photograph urban landscapes. His first project Milano ritratti di fabbriche 1978 –80 portrayed the Milanese industrial area. In 1984 he was invited, as the only Italian photographer, to work on the project of the Mission Photographique de la DATAR, an enormous undertaking promoted by the French government to record the contemporary French landscape. In 1991 Basilico was part of a group of international photographers on a photographic mission to document the city of Beirut at the end of the war. Since then, Gabriele Basilico has carried out many solo and group campaigns on different cities all around the world and his work has been presented in many shows, books, and catalogues. Among them Porti di mare (1990), Bord de mer (1992), L’esperienza dei luoghi (1994), Italy, cross-sections of a country (1998), Interrupted City (1999), Cityscapes (1999), Berlin (2001), Beirut (2003), Scattered city (2005), Montecarlo (2007), and Intercity (2007). The latest realized photographic projects are: Silicon Valley commissioned by the San Francisco Museum of Modern Art, Roma 2007, Vertical Moscow, a photographic survey on the urban landscape of Moscow portrayed from the top of Stalin’s Seven Skyscrapers, Istanbul 05.010, Shanghai 2010, Beirut 2011, and Rio de Janeiro 2011.